Back in Addis! 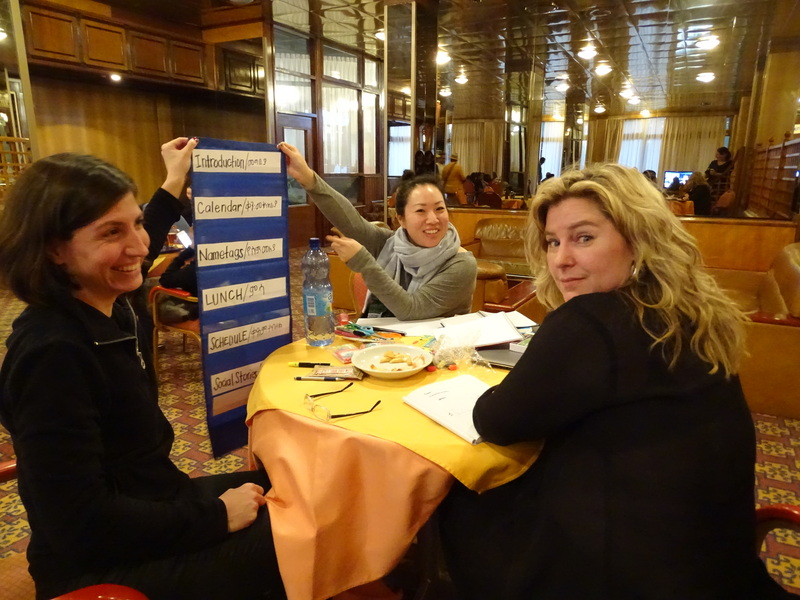 After departing the lovely Lalibela, we spent the afternoon back at the hotel preparing sample augmentative and alternative communication (AAC) materials for our professional development day at Nehemiah. We broke into teams and made calendars, schedules, name tags, and social stories. When we came together, we practiced explaining strategies and activities associated with the materials we made. We are looking forward to collaborating with the teachers to create customized materials for their students and classrooms. Tomorrow will be an exciting day! Note: We got a bit behind in the blogging during our travels, so be sure to check out the previous posts below from Friday and Saturday. What an enthusiastic bunch! And Ethiopia sounds like a treasure. Keep up the good work, and I can’t wait to read about your professional development day! Sorry if I seemed MIA! I’ve been commenting on Facebook posts and then I realized I could actually comment here too! Now, I check the blog every night before bed! …That’s so wonderful to hear! Glad you are loving every minute of it, Dr. Oz! 🙂 I love reading about the group’s adventures and love seeing pictures! How did the professional development day go? Loving these updates! Hope the professional development day was a smashing success! What an amazing day! I have loved reading the blog! My clinical experience in Ghana was one of many highlights at TC…You are all so lucky to have Dr. Crowley and this opportunity…WOW what amazing work you are all involved with there!!! Oh wow so tomorrow is your big professional development day! So exciting! Love the pictures! So good seeing that Özge joined the group (hi Dr. Oz! 🙂 ) and seeing Dr. Edmonds in a picture too! Wishing you all the best tomorrow! The materials that I could see look great! Hi Meg! We were starting to worry about you not commenting on any posts so far 😉 Just joking! So happy to be here, I am loving every second of it. Africa is beautiful and Ethiopians are beautiful people inside and out. I am feeling so grateful that I have this opportunity (Thank you Dr. Crowley!! ).